I am sure some of you have already noticed we have had a bit of change in our sim during the holidays. We have a brand new building! The new building is still modern, but it is much easier to navigate and browse around. Our products are much more visible and easier to find, hoping for a better and friendlier shopping experience. Come check out the new build if you haven’t yet and let us know what you think. We haven’t had a sale in over two years, so it’s about time we do. Come down and check out our 2010 Winter Sale. 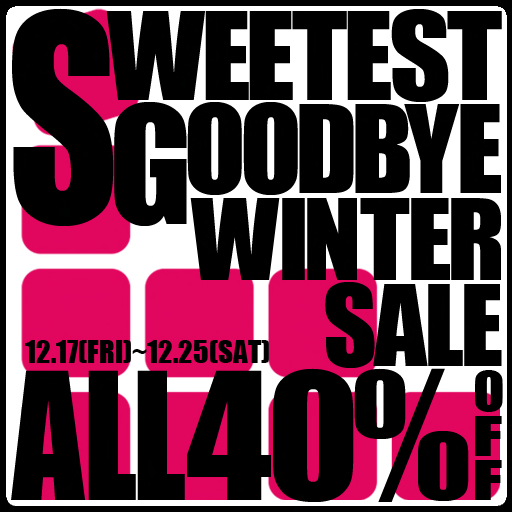 You get 40% off in all Sweetest Goodbye items in the store, except for our recent release, 4Minute. The sale is good only for one week till Dec 25, so come down to the store and take advantage of the discount while it lasts. Happy Holidays! Following our K-Pop series, we have just released Oh!, an outfit inspired by Girls’ Generation, another Korean girl group, extremely popular in Asia. Girls’ Generation (also known as Sonyushidae, SoShi or SNSD) is a group of nine girls, extremely talented but also well known for their beauty. Their outfits often show off their lean and long legs. Check out the music video below. Oh! consists of a cropped sports jacket and belted micro shorts, available in four lovely colors: red (worn above), orange, pink, and blue. They are sold at L$400 each. The fatpack of all four colors is available at a discount, sold at L$1000. The boots are sold separately for L$600 each, available in six different colors: black, brown, grey, pink, red, and white (worn above). The t-shirt worn above is an old release called Star Top. These are available in eight candy colors: red, grass, magenta, blue, green, purple, pink, and yellow (worn above). They are only L$70 each. Note we are now offering Oh! in blue color at a special price of L$300, that is L$100 discount from its original price of L$400, till 12am Sunday. Also, don’t forget the Halloween Special Dollarbie is only available for few more days. Come down and check out the new release and limited time offer. Check out our Halloween special, Jack-O-Bra! This is a fun dollarbie available only till the end of this month. I find the pink and blue gingham pumpkins adorable. It’s something for the season yet not in your usual boring colors, black and orange. Come pick up your copy at the store now! In celebration of Kara’s debut in Japan, Morphine and Sora created this outfit inspired by Kara’s wardrobe. Kara is a Korean girl group consisting of five members. The group’s name Kara derives from Greek word “chara” which means sweet melody. They are extremely popular in Korea, known for their cute appearance, sweet voice and dynamic dance moves. For those not familiar with Kara, check out the music video below. Kara’s outfit consists of a cropped t-shirt tied at the back, baggy pants with hanging suspenders, leather gloves, chain necklace, bracelets and armband. The accessories are sold as one package for L$150. It includes bracelet, armband, necklace, a pair of black gloves, and a pair of silver gloves. The knotted t-shirts are sold separately for L$190 each. There are two fatpacks available, plain and patterned. Each pack contains four different t-shirts, and sells for L$500. The plain pack contains four plain t-shirts: brown, dark grey, indigo and khaki. The patterned pack contain four t-shirts with different patterns: skulls (worn above), pic printed, paint printed, and stripe. The pants are available in four vibrant colors: black, blue, orange, and red. They are sold separately for L$220 each or fatpack of all four for L$600. Morphine Janick and Sora Ashbourne just released a new version of their best selling item, School Girl. School Girl 2 comes with a fitted blazer paired with matching plaid mini-skirt. 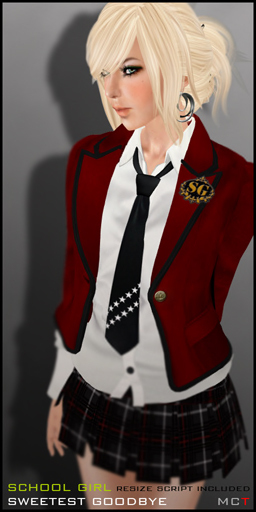 The set also comes with an improved white shirt and prim tie. Available in four different combinations, each set costs L$450 each. All four jackets, skirts and tie are different, so if you are fan, I recommend you get the fatpack for L$1100 which contains all options and mix match to create your own school uniform. I am wearing the black and red combination.